One year ago the Twins sailed into the All-Star break with two players, Miguel Sano and Ervin Santana, representing the club at the Mid-Summer Classic. Neither of those players and a long list of others haven’t lived up to expectations in the first half. It’s been a roster full of flounders. Sadly it is a pretty long list, but to me the clear answer is Byron Buxton. It doesn't all fall on his shoulders – injuries, bad luck and questionable decision-making from the front office have played their parts – but however you want to apportion the blame, Buxton's season has been a massive letdown. At age 24, and coming off a breakthrough second half that earned him down-ballot MVP votes, Buxton had the looks of a centerpiece. His ceiling was sky-high and the floor seemed to have risen as the rawness dissipated. I think we'd have all been happy with him reproducing the 3.5 WAR he produced in a 2017 campaign marred by prolonged early slumping. Instead, Buxton has delivered -0.4 WAR through the Twins' first 94 games this year. When not on the disabled list or in the minors, he has been a sub-replacement level player, and that's just not something I would've ever imagined. Most alarming: As he continues to whiff at a 30% rate in Triple-A, and now faces another injury-related absence, it's getting harder and harder to see him making any real impact for the Twins in 2018. I feel like this is a bit of a trick question. Since the specific wording is "underperformed" I'm going to leave out the guys like Byron Buxton, Miguel Sano and Jorge Polanco who just haven't been on the field much. Oh, and toss Ervin Santana and Jason Castro in there ... dang there are a lot of guys who haven't been able to contribute. The free agent addition trio of Logan Morrison, Lance Lynn and Addison Reed immediately stand out as underperformers. Man, even two of those guys are on the shelf right now. With both Morrison and Reed I have some real concerns they're never going to be assets again. Morrison has been hitting the ball hard and his strikeout rate is down, but the shift is killing him. It feels like the league has figured out how to pitch to him/position against him. Maybe he makes a counter adjustment, but I'm not super optimistic. He also adds no value in the field or on the bases and plays the position that's easiest to replace. No pitcher is going to deal well declining velocity, but a two-pitch guy who loves to pound the zone like Reed is really going to slip. Hopefully he'll rest up, come back refreshed and find those extra couple mph he's been missing, but the fear is that arm has just seen too much wear and tear. He’s been remarkably durable for today's standards, but nobody's immune to aging. Well, except for Fernando Rodney, of course. There were a trio of players that came to mind when I came-up with this questions. Miguel Sano, Byron Buxton, and Logan Morrison have all underperformed but I went into the season with higher expectations for the first two players on the list. Sano and Buxton were supposed to be the heart and soul of the Minnesota Twins for the next decade. Right now, it’s hard to imagine either of them playing in meaningful games at the big league level in 2018. Sano looked utterly lost at the plate this season and he is down in Fort Myers trying to reset his professional career. Buxton has fought through injuries but he has struggled when he has been on the field at the big league level and at Triple-A. Entering the season, I expected Buxton to take the next step especially after the way he played in the second-half of 2017. He has taken multiple steps in the wrong direction and that’s why he is the player who has most underperformed. While we knew going in that it was unlikely Morrison would repeat his success from 2017, it wasn’t exactly like Morrison was a slouch before then either. While his first half numbers haven’t looked all that appealing at .192/.289/.357 with 10 home runs, Morrison has the potential to find his home run stroke and breakout at any second. Talk about a question that has an endless list of possible responses! Byron Buxton? Miguel Sano? Ervin Santana? I mean… one of those guys hasn’t played a game so far and the other two arguable hurt the team by playing in the games they DID show up for. If I have to choose just one, I’ll go with Sano. Santana was supposed to be ready to go by May or June, at the latest. It’s almost August and we haven’t seen him anywhere near Target Field. Buxton couldn’t hit his weight in 28 games with the Twins and hasn’t hit a whole lot better in Rochester since supposedly becoming healthy after injuring a toe. Sano didn’t hit his weight either… though, to be fair, his weight has ballooned to the point where not a lot of MLB players CAN hit at that level. He’s hitting .328 at High-A Ft. Myers so I guess at least he’s hitting his weight at that level… probably. But Sano has hit just 2 home runs in 64 at-bats at Ft. Myers and let’s face it, hitting for power is really the ONLY thing this guy brings to the table at this point. If he can’t do that three levels below the big leagues, that’s more than just a little discouraging. I have some hope that Santana will return and contribute in the second half of the season and it looks to me like Buxton could, as well (though with Cave’s work, there may not really be any rush to get Buck back at this point). But Sano? Maybe if I had read something… anything… about his conditioning being significantly improving, I’d have some optimism. Right now I have none. I am resoundingly in the camp of two players for this question, and they are the two whom were expected to propel the Twins into their next level of competitiveness after they reached the playoffs in 2017. They're also both currently playing in the minor leagues because of their struggles. I'm obviously speaking of Byron Buxton and Miguel Sano. Buxton followed up his blistering second half of 2017, where hit hit .300/.347/.546 (.893 OPS) with 24 extra-base-hits (11 home runs) and 35 RBI in 56 games, with a 2018 line of just .156/.183/.200 (.383 OPS) in only 28 games. This was before and during, but thankfully not after his foot injury, when he was sent to in Rochester to regroup and has just a .679 OPS in eighteen games. Sano followed up a 2017 season that saw him be selected to his first All-Star Game, where he also finished runner-up in the home run derby, with a miserable 37 games with the Twins before they made the what some might call drastic move, in sending him all the way down to Fort Myers. He hit just .203/.270/.405 (.675 OPS) before that move and his road back may be a long one. If they can get even one of those guys back to playing like they had in 2017, things could look better for the Twins in the second half. Kinda depressing topic ...but a lot to discuss and debate, sadly. With regard to Sano, I agree that he's very relevant for the topic...but to use Ft. Myers HR numbers to make the argument?My presumption would be that he's at Ft. Myers to do everything BUT work on his power stroke....including things that would initially inhibit his HR rate, like letting the ball get deeper and learning how to get certain pitches and drive the ball to center and right.Of the 101 things to worry about with Sano, his long-term ability to hit a ball over the fence comes in at 102, IMO. Not really much of a debate here. Buxton and Sano and no one else is even close. None of the FAs brought in were supposed to be a franchise cornerstone piece. These 2 have to figure things out quickly. While I agree Sano has been a disappointment, we have to remember that he was coming off an injury and had the prospect of a suspension hanging over of his head.It stands to reason that consciously or unconsciously Sano and the team were fully prepared for a 50 game suspension with the silver lining that it would give him time to fully come back from his injury and give him the jolt he needed to get his head together.It almost seems like the franchise and Sano were caught flat footed by the dismissal of the allegations.What is happening with Sano now - is essentially what would have happened had he been suspended. So it is fair to say that his performance, while disappointing, was not unexpected.As a result, I am hopeful that we will still see him in August with a new attitude and more conditioned body. Buxton, on the other hand, is the major disappointment - for all the reasons described. Most troubling is the injury albatross around his neck.The guy can't seem to stay on the field for any extended amount of time. I have to believe that his health has complicated his struggles.I don't see him making any meaningful contribution this year - not until September at least. Buxton, followed closely by Sano. I'm not sure how anyone else could be the choice, frankly. Serious question: do statcast projections take shifts into account? Because, if they don’t they would seem pretty meaningless and would explain a lot of “underperformance”. But how can they, because not every team shifts player X exactly the same way? The two that have under perfomred and the two that have the best chance of regaining form are the same two - Sano and Buxton. Morrison, on the other hand, may be performing at or close to the level we can expect going forward.He can't adjust to the shift, provides no added value on the field or one the bases and is becoming what he was before last year - a guy with a .685-.735 OPS or, put differently, a 90-100 OPS+.I'm not sure he's under performed that badly.He may just have come back to earth.He's also almost 31 so it's not like he's still a progressing prospect. He is what he is. To me, it's Buxton and it's not even close. Sano and Morrison...major disappointments, to be sure. But there's no doubt that both of them are MLB players and can compete at the MLB level - whether that's with the Twins, or someone else. While Morrison's career may be winding down, he's got the track record suggesting he'll catch up...that's not much, but it's something. Ditto for Sano. Aside from his massive slump after returning from his hamstring injury this season, he's been above average as a player for his entire career. He has a future and I'm guessing we'll see him back in Target Field soon. Buxton, on the other hand, is at the point in his career where people are legitimately questioning whether he's a major league-caliber player. Aside from a hot 2-month stretch last season, he's really not done much to merit a spot on the roster due to his offensive ineptitude. He's become an easy out in a league (and at a position) where players can't afford to be completely incompetent at the plate. We could be watching a documentary in 20 years titled "The Sure Thing That Wasn't" or something like that on ESPN. Sure, the Twins can be patient. But if he comes back next spring and struggles out of the gate...we could be facing the reality that Bux just ain't a major leaguer. He's got plenty of excuses but at some point you just have to do the thing. These are my feelings as well. I wasn't really expecting a big season from Sano this year. Buxton on the other hand....Thought he'd be in the all star game easy and I would of been disappointed with a 3.5 WAR season. Obviously I'm really disappointed with what we got. Morrison, Santana, and Dozier aren't really part of the future, so I'm not that concerned about their regression. Little bit worried about Kepler, but I think he will turn it around. I think the biggest disappointment was Polanco with his failed drug he needlessly missed half a season when we needed all hands on deck to stop the offensive slide. Sano has to loose weight and fix swing. He will need till late August minimum for weight. And Buxton and Sano are definately big losses and letdowns. Polancos was of his own doing. And when you sabatoge yourself, that is the biggest disappointment. Note i do forgive Polanco and hope this doesnt happen again and he hits over .800+ OPS for the rest of the season. But we need all the offense we can get now. Also moving forward its going to be Buxton/ Sano until they re-establish themselves.but that is from today going forward and not in the first half.I am confidant Polanco will be part of the solution moving forward. I know there are some computer gurus out there that can probably figure this out. But my question is.... Have there been any real superstar athletes in baseball that have been sent down to the minors as many times as Buxton has?? I mean I see guys like trout and etc.... When they finally get the call they for the most part, stay up?? I can see being sent down once, but it would be interesting to see how many great players have been sent down multiple time like Buxton has. I would bet there hasn't been many? I dont understand any answer to this question that isnt "Buxton and/or Sano." I think Torii Hunter got sent up-down a bunch of times. And how about that Max Muncey in LA? Dude's killing it right now, made the All-Star team and HR Derby at age 27. He got sent down, dumped, outrighted, re-assigned...seems to have found his stride, much to the chagrin of the Oakland A's. Guys like him are boogymen because it makes a team never want to give up on a player - just in case. But as for mega-stars? Bonds, Griffey, Trout, A-Rod, Jeter, Harper type guys? No. They weren't on the shuttle bus. I'm a little surprised my candidate didn't get discussed: Max Kepler. Kepler doesn't have the excuse of injury to explain his struggles, and simply has not taken that step forward we were looking for. he had a hot start in Mar/April, struggled in May, was a disaster in June and has had a good start to July. But right now he's nowhere near the hitter we were hoping for and his abysmal BA and lack of power so far is making him look much more like a 4th OF than a guy who can be a staple in the OF for the next 5 years. Morrison has been unlucky and bad, but I didn't expect as much out of him: his signing always felt like a "well, this guy is out there for cheap, why not add the bat?" rather than a "we're counting on Logan Morrison". 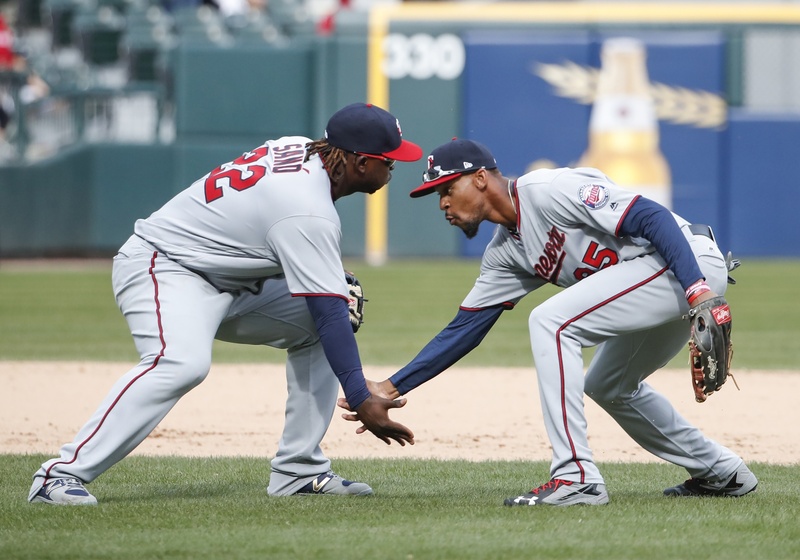 Buxton and sano have had injuries which is a shame, but...it happens. yes, neither has hit like we need when in the lineup, but I might actually be more concerned about the guy who is healthy and isn't hitting than the guys who haven't had that same health. I'm not giving up on Kepler, but he faded badly last season and has had a poor first half. He needs to start mashing RHP or instead of holding down RF as a mainstay he's going to be fighting with Lamonte Wade for the 4th OF job, and that's a waste of talent. I'm pointing the finger of blame at Tyler Kinley. When he didn't come through, it kind of set the tone for the entire season. This is an easy question, it's not even close.It's Sano.He provides exactly nothing to the team right now.If he can't hit, he doesn't do anything else well.Buxton can still play defense and has speed that can be used.Huge disappointment, but he has other tools than can be utilized. A good team, a team that makes a playoff run and into the World Series, you look at the numbers for position players, and there are multiple career high players on that team. That's the way it goes in MLB: your team succeeds, it's because of players having great years. It's all about who has let us down. And the list is long, starting, alarmingly enough, with our best young players -- Sano, Buxton, Polanco, Kepler -- and including our best veteran players, Dozier, Mauer, Santana, Castro, Morrison, Lynn, Reed. So, are the Twins still in this? Can they make it interesting and have meaningful games. Maybe.That would be a great achievement at this point. But they can't pretend to contend for anything of substance. And there are many, many players who have contributed to their lackluster play. Sure, there have been worse years for the team, but, one could argue, that, individually, and based on potential, this team has been, pound for pound, the most disappointing team in Twins' history. He's got an OPS+ of 97 and his positive fWAR is based almost entirely on his defensive contributions. He's got a BA under .230, had long stretches where he's looked lost at the plate, and his power production has slipped a little this year. He's not a bad player, but he sure is a disappointment this season. I was about to say something similar, but maybe not quite as strongly. And then I thought some more. Defense from a corner outfielder is worth something but isn't really decisive, and to be an actual asset you want a corner outfielder to be above league average on offense. Conversely, if you want to consider his flexibility to cover center field for short periods, his defense is no longer a plus at that position. All in all, his season is just a hair below average. In a season where we needed someone to step forward, he's a contributor, but not more. He's not one of the major disappointments of the season, but I wouldn't call him a triumph either. I'm no computer guru. But the frustrations with Buxton often remind me of Charlie Blackmon. Blackmon was up and down from AAA and struggled with injuries for more than two years before sticking with the Rockies. Now he's an MVP candidate and fitness freak. I think Buxton's struggles this year have primarily related to injuries (migraines and broken toe), and he can and will overcome them. Once his health stabilizes, he's going to be a stud. And I believe the same about Sano.